All of the games are well designed to be enjoyable as well as educational. They are good enough that it seems like they are almost sneaky since the kids really do not realize they are learning. All of the applications include high quality graphics and sound and the user experience of the modified Android operating system is easy for the kids to learn. My four year old had no problem jumping in and exploring the folders. He was instantly able to remember what each icon stood for and is able to use the tablet completely independently. The design of the tablet makes it safe in his hands and helps my piece of mind knowing it likely will not come back to me destroyed. If you have children who are already tech geeks (like their parents), the Vinci Tab is a fantastic introduction into the tablet world. Not only will they become comfortable using the device, but they will also accelerate their development. If you’ve ever handed your kid your Apple iPad and gotten it back in questionable condition, you’ll immediately grasp the value of a child-proof tablet designed specifically for children. Combine educational content designed specifically for young minds and a design that ruggedizes the delicate tablet, and you’ve got the Vinci Tab. The concept is right for this toy/tool aimed at kids up to age 4, but the execution is a bit off: The Android-based tablet is loaded with software that isn’t as good as it could be, and makes it difficult to access the wide array of children’s content that’s already out there, instead favoring its own sparse selection. Though its potential is virtually limitless, for now, the Vinci Tab is mostly just an expensive tablet your kid can’t break. 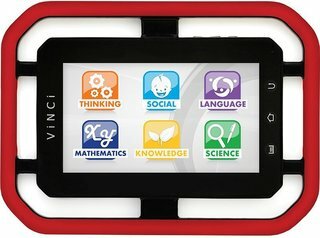 If you happen to have a miniature human running around your office or home like we do, a small incarnation of yourself (you gadget geek, you) who lunges after every electronic in the room, you need the Vinci tablet. For the purpose it aims to serve — keeping young kids entertained while also teaching them in a new, modern way — it’s a great tool. At the same time there are some issues. First of all, we think the hardware itself could be a bit more protective of the display in particular seeing as how that’s the only way of interacting with the device. Break the display and you’re up a certain nasty creek without a means of propulsion. The software side of things is a tad worse off. While there is a small but quality selection of interactive apps, the system overall feels slow. As we touched on earlier, that could be from either aging hardware, inefficient software or a combination of both. Whatever the case may be it detracts from the overall experience. Visit the VINCI Q&A Forum to get answers, ask a question or help others.